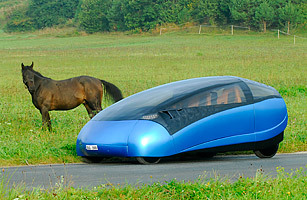 The car of the future, now coming from: Hungary. Yes, it sounds like communist propaganda circa 1967, but the Hungarian designer Antro might just have made a superefficient, supercheap car that could put Western manufacturers to shame. The Antro Solo can hold up to three people  a driver and two passengers, one on either side  who pedal to help drive the ultralight car. The rest of the forward motion comes from an electric motor that's partly powered by solar panels. If you need a bigger car, Antro has a solution: two Solos can be combined, Transformers-style, to create the family-friendly Duo. Look for it in 2012.